We sell a full line of patterns, books and booklets to explore for your next project or teach you the skills you need to complete any garment. Realizing that many knitters and crocheters are now finding their inspiration on Ravelry and other design and pattern websites, we still believe that flipping through pattern binders and perusing books can be fun and inspirational. Books are also a great gift for the stitcher in your life! Our shop is full of sample garments for you to touch, inspect, and try on. If you don’t see what you are looking for, please ask us... we are here to help! We sell a full line of patterns, books and booklets to explore for your next project or teach you the skills you need to complete any garment. 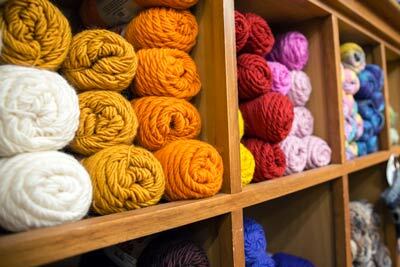 Realizing that many knitters and crocheters are now finding their inspiration on Ravelry and other design and pattern websites, we still believe that flipping through pattern binders and perusing books can be fun and inspirational. Books are also a great gift for the stitcher in your life! Our shop is full of sample garments for you to touch, inspect, and try on. If you don’t see what you are looking for, please ask us... we are here to help!